Prime Minister Vladimir Putin has taken another step to boost his charisma by holding a wrestling session with members of Russia’s national teams. The training took place on Wednesday evening in a brand new sports hall in St-Petersburg, with journalists and photographers watching on. 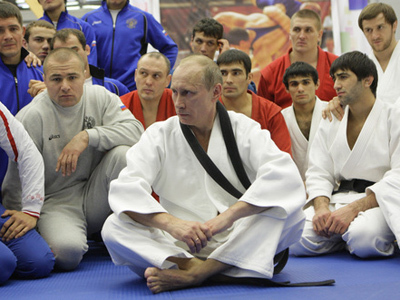 Putin holds a black belt in Judo. However, he did not just limit himself to the Japanese martial art, he also showed off his skills from its Russian analogue Sambo and from Greek-Roman and freestyle wrestling. The training followed talks with Armenian Prime Minister Tigran Sarkisyan. Some reporters saw obvious symbolism in the fact that the Russian prime minister chose Arsen Galstyan as his opponent – an ethnic Armenian who got a prize in this year’s judo championship as a member of the Russian national team. Andrei Kolesnikov, a reporter from Kommersant daily said that most sportsmen in the hall were from various republics of the North Caucasus and all of them were relatively young – just like the football fans Putin met a few days ago while visiting the grave of the Spartak supporter killed in a fight with several young men from the Caucasus. The murder sparked a string of rallies and riots in the Russian capital. After the training Putin talked to leading wrestling coaches and Russian sports officials and said that international friendship was an important factor for future victories. “We have a real international [team] here, all of the North Caucasus, Smolensk, Siberia. We have the first champions from Yakutiya. This is the only way we will win!” the Russian Prime Minister said.